Obstacle course rentals in Cleveland, Akron, Medina and other surrounding areas in Ohio. The perfect inflatable rental for any large event or backyard birthday party. Whether you’re having a church picnic, a corporate event or even a school field day, an obstacle course is the perfect choice. The best part about these awesomely fun inflatables is that they allow for a high throughput; meaning, no participants are left waiting in line too long. There is a constant flow of fun and excitement. Party Favor Event Rentals is proud to offer other great items as well. 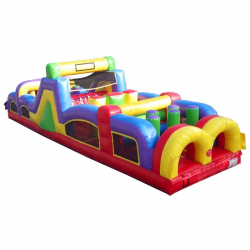 Be sure and check out our great selection of bounce houses, water slides and more. Our inflatable water slides are a great way to keep your guests cool during the summer months. You can rest assured that Party Favor Event Rentals will provide the perfect experience for you and your guests. Be sure and take a look at our reviews on Google and Facebook. We look forward to providing the fun for your next party or event.